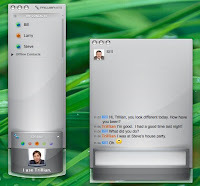 Cerulean Studios last week announced that it will be releasing a Mac OS X version of Trillian, one of web's most popular multi-protocol chat client which lets you connect AOL, ICQ, MSN and Yahooo networks. Trillian Astra for Mac OS X is currently in alpha stages and it's not just a part of the existing Trillian software, but instead its UI was written from scratch. Existing Trillian Astra users can request the first build, but Cerulean Studios is also looking for more Mac OS X testers via this sign-up form.